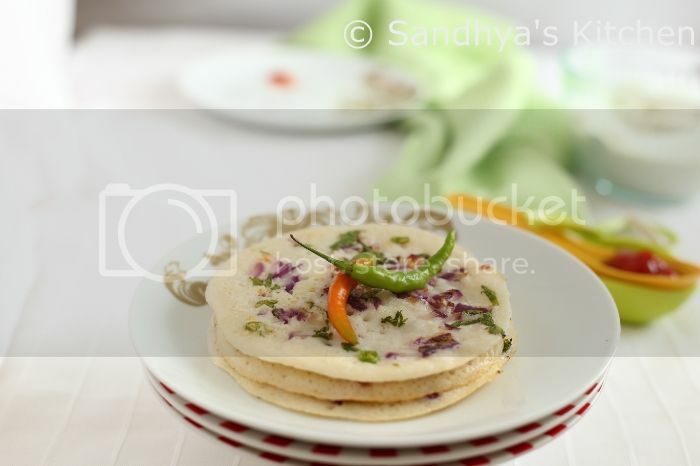 When I was walking down to school, I was thinking what could be my first post after a break… Rackling my head hard, my lil miss sunshine smiled at me ..And I knew it got to be one of her favourites.. Onion Uthappam. Miss S doesnt like plain dosa’s with sugar…as opposed to her elder brother !! And this is my favourite too .. A teeny bit of heat to this classic southindian dish ! A clear difference between a dosa to an uthappam is that the latter is thicker and the first is prefered thin and crisp .Again its entirely a personal choice. Uthappams can have toppings of your choice.. Onion Uthappam , Tomato Onion Uthappam , kids friendly can be cheese uthappam , mixed veg uthappam . They are served with Coconut Chutney , Tomato Chutney & Sambar . But I just like it with Ketchup 🙂 and Coconut Chutney. One can have an uthappam for breakfast, brunch or after an evening tea.. We had it for breakfast today .. Finely Chop the onions ,green chillies and coriander leaves. Season your chopped onions with salt..This is purely optional. Heat your non stick tava or hot iron griddle. 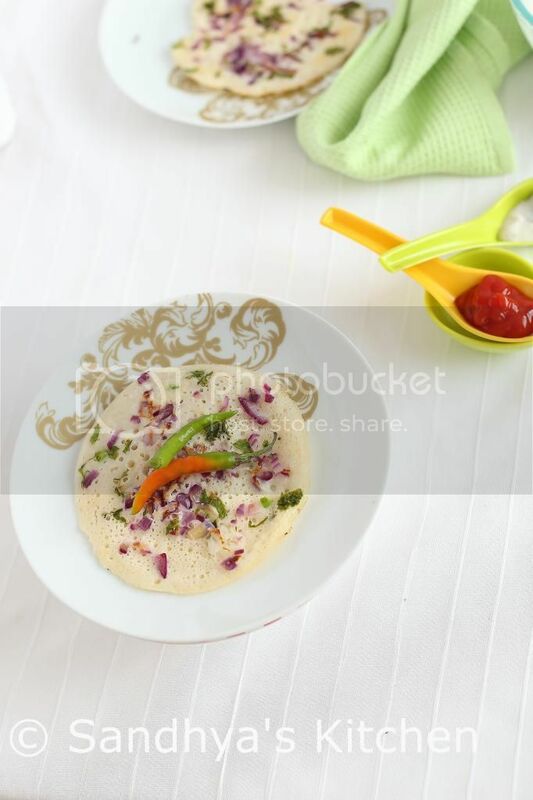 Spoon in a laddleful of dosa batter and spread it lightly. Sprinkle in chopped onions ,green chillies and the cilantro. Add a few drops of oil around the uttappam and cook it in a medium flame. After a minute or so , flip the uttappam and let it cook for another a 1.5- 2 minutes until the topping gets slightly crisp. At this stage you can remove the pancake and serve it with tiffin sambar , coconut chutney & tomato chutney. As I enjoy it with tomato ketchup… I dunked my uttappam in ketchup . You can buy dosa batter from an indian grocery store or can make it at home. I do not have the receipe posted , but hoping to post one soon. There are alternative ways of making uttappam. 1.Mix in your topping with the batter and then scoop it on to your tava. Flip on either side cooking for 2 minutes and serve. 2. After scooping in the batter on to the tava and sprinkling in your toppings followed by adding oil. 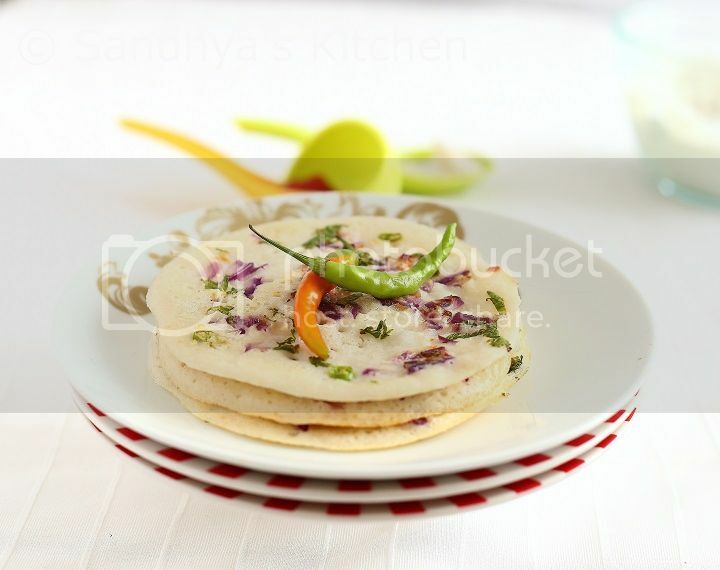 .you can cover the uttappam with a plate or a dome shaped lid and allow it to cook. I believe this pancake as an excellent alternative to plain dosa’s for kids. 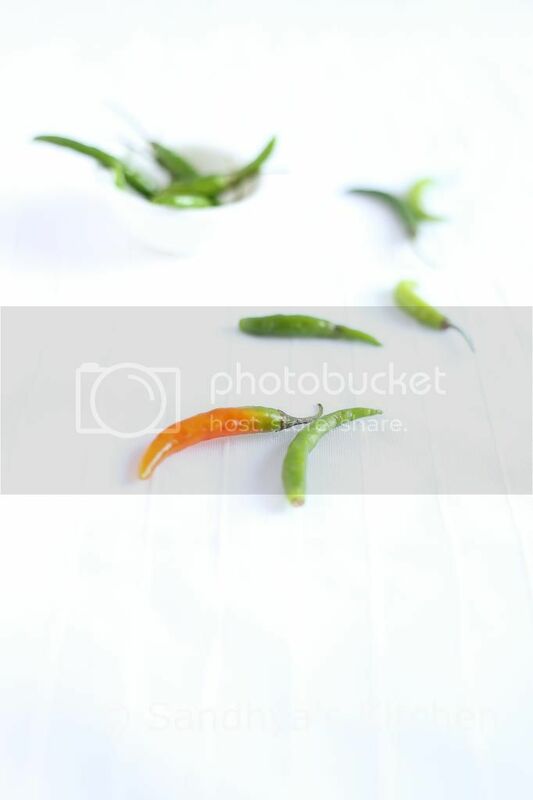 You can avoid green chillies and use ghee for lubrication . For making this pancake, I do not wait for the last batch of idly/dosa batter or so.. I just make it whenever we like and its still yummy. Amazing clicks……. Uttapam looks tempting!!! All pictures are speaking and your way of taking picture and style didn't change a bit even after two years.It looks very fresh. Happy to see you back…. I love to start my day with this aromatic utappams, serve me with some chutney i can have anytime. These lentil pancakes look scrumptious. Welcome back Sandhya….Its pleasure to see you back…I know how it is when you have two kids to take care with no helping hand…in a country far from home…..Love the new and fresh photographs…love to both the kids and recipe sounds yum to me….